And when defenders were in Ibrahim’s way, he simply lowered his shoulder to run over them. The Yellow Jackets (7-6) did not have the speed or strength to slow down Ibrahim, who was so effective Minnesota didn’t have to punt once. And, their triple-option offense was stunted in coach Paul Johnson’s finale . “They did pretty much whatever they wanted,” said Johnson, who is retiring as Georgia Tech’s coach. We never stopped the run and then we let them throw it over our head a couple times. 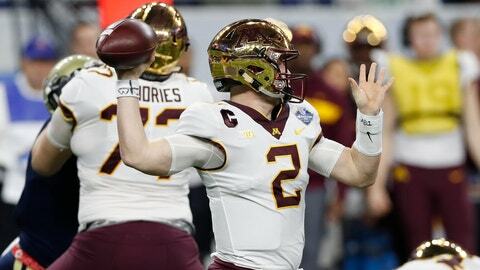 Minnesota led 13-0 early in the second quarter after Tanner Morgan threw an 18-yard touchdown pass to Tyler Johnson in the first quarter and Emmit Carpenter made two field goals. Ibrahim’s 3-yard touchdown run midway through the third quarter made it 20-3. The Yellow Jackets responded with Nathan Cottrell’s 20-yard touchdown run, but their defense allowed Ibrahim to score again on the ensuing drive. Morgan connected with Johnson on a 30-yard touchdown strike with 6:19 left, giving the Gophers a 24-point cushion. Georgia Tech: The Yellow Jackets were in trouble when they fell behind because they don’t pass much, making it tough to come back. They averaged fewer than 10 passes during the regular season and it was clear both of their quarterbacks were not comfortable dropping back to throw. “The hard work and dedication paid off,” he said. “If you don’t do the right things, you’re not going to travel,” Fleck said. Georgia Tech: It will be challenging for Geoff Collins to win in his coaching debut with the Yellow Jackets. They play Aug. 22 at Clemson in the first game on the ACC Network. The former Temple coach, who is from Georgia, will be installing a new offense without a handful of starters on offense and the defense is losing eight starters.